Would you like to cut your fluid handling costs by as much as 80%? Would you also like to reduce the risk of spills and injuries? Consider an alternative fluid storage and dispensing system for oil, lubricants, and industrial fluids. Eliminate heavy drums and the requisite drum handling equipment that accompanies them, and try a lighter, more mobile option. CMH has the perfect solutions for your fluid handling needs. Our fluid storage and dispensing systems improve storage by providing better ways to handle oils, lubricants, or any industrial fluid. There are many different ways the fluid storage and dispense system lowers costs for your business. Traditional and more inefficient methods of fluid transfer and storage can lead to numerous safety issues in your facility, as well increased cost due to spills and other problems. Drums and drum pumps that require tipping, cleaning, and replacing cut into your bottom line. And not being able to keep them close to your work area is a waste of space and time. When workers have easier access to lubricants and other industrial fluids, they are able to be more productive. Work gets done faster and with less effort. Without large drums to move and pour, there are fewer spills which are hazardous and costly to clean up. Liquids dispense through nozzles, eliminating the need to pour. When workers are not required to handle heavy drums full of liquids there are fewer injuries. There is no need to stack drums that could potentially fall and cause injuries. Less chance of spills that could create hazardous work conditions. Fluid storage systems make it easier to access necessary liquids when needed. Storage carts are mobile and can be moved around the workplace right to the site where liquids need to be dispensed. 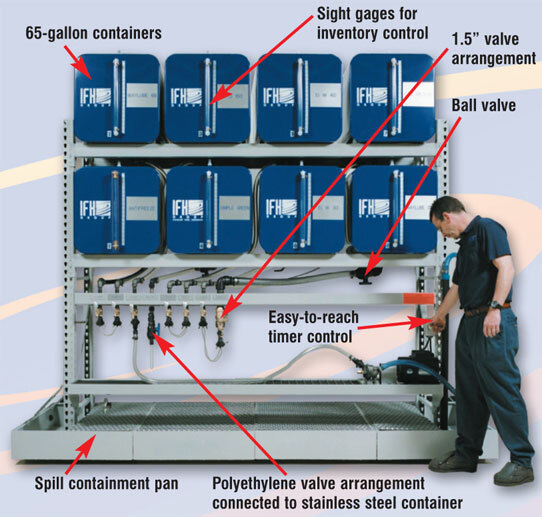 The fluid storage system is a more efficient use of space than round drums. The square shaped containers are made to fit side by side on shelves with dispensing nozzles below. No moving or pouring is necessary. In most cases it is easier to take the necessary liquids to the machines that need them rather than the other way around. The mobile fluid handling cart makes it convenient to move liquids around the workplace without spills. The cart maneuvers easily on load-bearing wheels with a tight turning radius to get around and between obstacles. 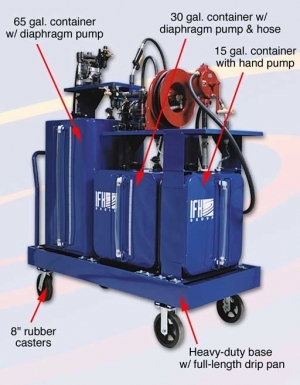 The cart saves money by eliminating multiple trips to fluid storage centers, making workers more productive. Sight gauges make it easy to control inventory and avoid running out of fluids. To get a fluid storage and dispensing system for your workplace, contact Carolina Material Handling at 800-822-8833. Save money and space, avoid spills and injuries, and make work more convenient and productive – the benefits are numerous. From aerospace to wood, pulp, & paper, fluid handling systems are used by most industries. Companies such as Boeing, Chrysler, Anheuser Busch, 3M, Exxon, Hallmark, and Rubbermaid are just some of the countless industry leaders that understand the advantages a system like the ones CMH can provide gives.